Discus fish's natural habitat includes the floodplains of the Amazon where animal and plant proteins are scarce. They have very selective taste and require very high protein and calcium intake demand especially when they are at the juvenile stage. Discus fishes also have a high demand for Astaxanthin and other carotenoids where they are needed for colour development. Our feed is formulated to ensure that all strains of Discus fish will be able to grow rapidly solely depending on DS-G1 as the only feed intake and absorb all the necessary nutrients provided. DS-G1 will also Improve the colour development in your Discus fishes and at the same time ensure sexual maturity when they reach adulthood. DS-G1 also contains our proprietary feed attractant to ensure the optimal consumption of our feed by the Discus. This feed is specially formulated to suit the unique development of Discus fish including all strains like Red Melon, Blue Turquoise, all the Albino, Pigeon Blood, all the Wild Discus and many more. It is also suitable for all Cichlids. 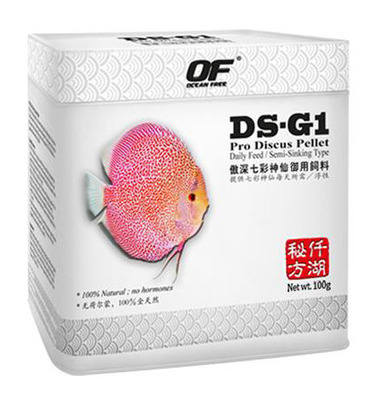 Most importantly, DS-G1 Discus Fish pellet Is a guaranteed hormone-free product that uses only the finest Ingredients to ensure that your Discus fish receive nutrition of the highest quality.